Bennett, Dooley, Benson, Trucano wins! 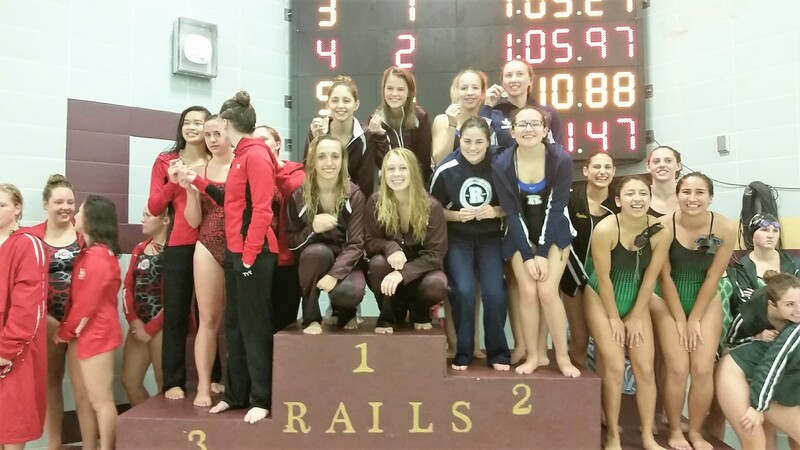 The Conference Championship Meet was held 10/19 (diving) and 10/20 (swimming). The meet was success for Rails swimmers and divers alike! Several athletes saw new personal and season bests. Plus, the Rails took second overall! Check out the recaps for each portion of the meet below. The diving portion of the meet featured five divers, four from Lincoln and one from Roosevelt. The Rails divers did a great earning the top three spots! Jolynn Harris took gold for the 3rd straight conference meet! Haley Allen dove a personal best score of 299.50, just shy of breaking into the 300 Point Club! Katelynn Vasey dove her first 11-dive meet and had a great score of 271.75! She stood up as 5th place on the podium (as a JV diver). Rails JV Medleys took first and second! Below are a just few of the great photos from the Conference Championship swim meet. Parents can always see the full array of photos from a meet on the swim team’s Shutterfly website. Just log-in. Contact us if you need access to the site.